Really, it’s becoming harder and harder to understand those who have no faith. The hand of God, of our Lord Jesus Christ, is so palpable in our Orthodox church life at times that one wants to just sit and marvel at it for a while. But this same life is also so full, bursting at the seams and overflowing its brims that one is compelled to move ever forward it its upward stream. This is particularly how we have been feeling at Sretensky Monastery in recent days. 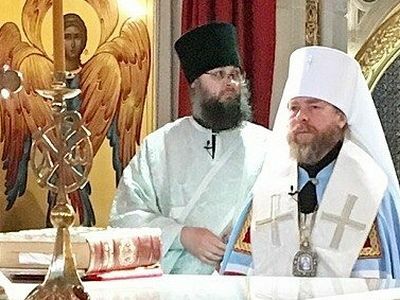 Last Monday we were all informed (this now happens in the twinkling of an eye due to modern technology) that our beloved abbot, Bishop Tikhon (Shevkunov) is now Metropolitan Tikhon of Pskov and Porkhov. All of us are under God’s special Providence, but those who know His Eminence cannot help but notice that there is something out of the ordinary here. Vladyka has written about the many amazing experiences of his life in the wildly popular book, Everyday Saints and Other Stories (Pokrov Publications, 2012) and we greatly urge all to read it; but we will give a few highlights of the Metropolitan’s life here. In the world, Georgy Shevkunov was a graduate from a prestigious cinematography school, with a concentration in screenplay writing. He began his monastic life in the ancient Pskov Caves Monastery, located in the town of Pechory in the Pskov diocese in the western part of Russia. This monastery played a very important role in Russian history both in the early days of Russian Christianity and in the Soviet era. It was always an outpost of Russian culture on the nation’s western border, with several important functions—the building of monastic life in the western regions, enlightenment of the local Finno-Urgic (Estonion) peoples, a safe refuge for those escaping from persecution by Livonian Catholics in the Baltic regions, and a fortress against attacks from Western invaders. It was (and is) a fortress in both the physical and spiritual sense—its strong walls built by the great abbot St. Cornelius protected it physically, while the Mother of God and St. Nicholas, patrons of the monastery churches, protected it spiritually from all onslaughts. God protected the monastery even during soviet times—it was one of the very few monasteries in the Soviet Union that was never closed. In Pechory, novice Georgy became a spiritual son of the famous elder, Archimandrite John (Krestiankin), who guided him in the spiritual life and did not deprive him of his wise counsel after the young monastic was transferred to Moscow to labor in the Moscow Patriarchate Publishing Department under Metropolitan Pitirim (Nechayev). After working roughly ten years in this obedience, and after Met. Pitirim’s repose, Georgy was tonsured a monk in the Donskoy Monastery. He was given the monastic name, Tikhon, in honor of the Holy Patriarch Tikhon, the new confessor of Russia, and was soon ordained a hieromonk. Patriarch Tikhon lived his final years in Donskoy Monastery and was buried there, but by the time the new Fr. Tikhon had come to Donskoy, people had lost the information showing where the holy Patriarch’s gravesite was—it had been purposely hidden to protect it from the communists. It was miraculously discovered with Hieromonk Tikhon’s participation, and the holy relics were placed in the monastery cathedral for everyone’s veneration. In 1993, Hieromonk Tikhon was appointed abbot of the newly-reopened Sretensky Monastery. Dedicated to the Meeting of the Vladimir Icon of the Mother of God and the subsequent deliverance of Moscow from attack by the Mongol Tamerlane, Sretensky Monastery began its existence in 1397. Durig the early soviet period, the future Hieromartyr Hilarion (Troitsky) served as the monastery abbot, and his close friend, Patriarch Tikhon, often served there. The soviet regime closed the monastery in 1926, and it was desecrated by the KGB. When it was turned over to Fr. Tikhon as a metochion of the Pskov Caves Monastery, it was in ruins—the only church that had not been demolished was in pitiful shape, with all its ancient frescos painted over, and the monastery grounds were strewn with debris. Fr. Tikhon rolled up his sleeves and began the colossal work of restoring the monastery. This meant carefully bringing back the old frescos inch by inch, clearing the grounds, building living quarters and a refectory, and negotiating with municipal authorities for additional surrounding buildings. Sretensky received the status of a stravropegal monastery in 1996. Gradually both the brotherhood and the dedicated congregation grew to such proportions that they could not fit into the monastery church on Sundays and feast days. In 2011, His Holiness Patriarch Kirill officially blessed the construction of a new, large cathedral dedicated to the Resurrection of the Lord and the New Martyrs and Confessors of Russia. Construction was completed in 2017 and the church was solemnly consecrated on the feast of the Ascension. On this last Pascha, there were over 3000 people attending the midnight service. Abbot Tikhon established and developed the Sretensky Theological Seminary on the monastery grounds, took over the operations of a collective farm in Ryazan province, establishing there a monastery skete and children’s home, built up a successful publishing house with hundreds of titles, launched the first Russian language Orthodox website (Pravoslavie.ru, still the leading religious website of Russia), started catechism classes for teenagers and adults, and inspired many other lesser known projects under the monastery’s auspices (including a theater school for people with Down’s syndrome). 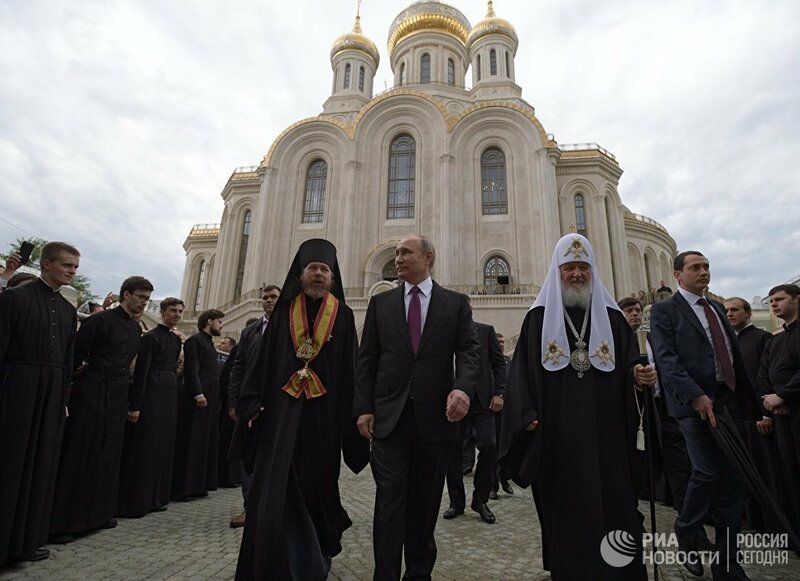 This is not to mention his role in the reunification of the Russian Orthodox Church Outside of Russia with the Russian Orthodox Church, Moscow Patriarchate. We have provided what is of course a dry, brief description of what Vladyka accomplished outwardly over his twenty-five years as the monastery’s abbot. But we will not ignore his cultivation of the brotherhood’s inward life. He was the brothers’ confessor, and did not neglect to guide them continually in the monastic life, meting rebuke and edification in and out of season. His care covered every member of the monastery conglomerate—all the patrons, hired workers, and parishioners. He was accessible to all, and no one was too low on the totem pole for his fatherly attention. He paid careful attention to every detail of the monastery’s life, and wasted no time righting any wrongs. Vladyka Tikhon is irreplaceable, his shoes can’t be filled and he will be a “tough act to follow”. However Sretensky Monastery will no doubt be functioning on his planning and energy for some time to come. His time as abbot having come to an end on the feast of the Ascension, these last few days have been proof positive of people’s sincere love for him. They have proven also the care that God has for all of us; for there have been so many heavenly hints and signs of God’s grace, which have sweetened the bitterness of our loss. Vladyka served in the Christ the Savior Cathedral on the feast of the Ascension, at which His Holiness Patriarch Kirill bestowed upon him a white klobuk—the monastic headdress worn by metropolitans in the Russian Orthodox Church. Waiting for him at the monastery were the brothers in formation along with others close to the monastery. Vladyka received all the bouquets gathered to congratulate him on his new rank, and gave everyone a word about the changes that have occurred. “Sretensky Monastery is henceforth independent—of me. You have an acting abbot, Fr. John (Ludishev). His Holiness has agreed to appoint a monk from among the brotherhood, and I hope that eventually the Synod will confirm this choice. I am no longer in charge, and that is proper. 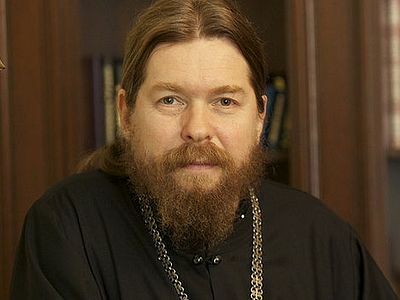 But of course we will always be spiritually connected, and I will not abandon those whom I have received here in the tonsure.” He also conveyed his deepest gratitude to all the brothers, sisters, workers, and “incomparable parishioners” of Sretensky Monastery. Vladyka looked down at the panagia on his chest. The panagia is worn by hierarchs of the Church in place of a pectoral cross. It bears an image of the Mother of God, the “Panagia”—Greek for “All Holy”. “I looked at the inscription on its reverse side. It reads, ‘In honor of the reunification of the Russian Orthodox Church, Ascension day, May 17, 2007’. 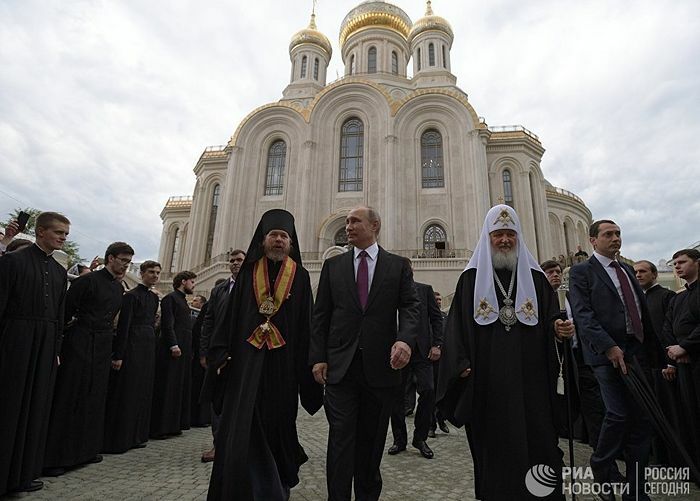 I had forgotten, but the reunification of the Russian Orthodox Church Outside of Russia with the Moscow Patriarchate took place precisely eleven years ago. The feast of the Ascension fell that year on May 17, and it fell this year on May 17, and this is the day of my new appointment, by God’s Providence.” Vladyka mentioned that he will be living at least initially in the Pskov Caves Monastery. “When I had to leave the monastery as a novice for Moscow, I prayed to God that He would bring me back. Now, thirty-two years later, that prayer has been answered…” he added, with his characteristic sense of humor. “Today in the Apostolic reading we hear about the Apostle Paul’s farewell to his disciples in Asia. And in the Gospel according to John read today at the Liturgy we are told of the farewell of the Lord Jesus Christ Himself to His disciples and friends. Everything in the Holy Scriptures is an example for you. The examples are incomparable, and infinitely exalted! Take heed therefore unto yourselves, and to all the flock, over the which the Holy Ghost hath made you overseers, to feed the church of God, which he hath purchased with his own blood. For I know this, that after my departing shall grievous wolves enter in among you, not sparing the flock. Also of your own selves shall men arise, speaking perverse things, to draw away disciples after them. Therefore watch, and remember, that by the space of three years I ceased not to warn every one night and day with tears. And now, brethren, I commend you to God, and to the word of his grace, which is able to build you up, and to give you an inheritance among all them which are sanctified. I have coveted no man’s silver, or gold, or apparel. Yea, ye yourselves know, that these hands have ministered unto my necessities, and to them that were with me. I have shewed you all things, how that so labouring ye ought to support the weak, and to remember the words of the Lord Jesus, how he said, It is more blessed to give than to receive (Acts 20:28–35). “In these parting words, which were heard almost two thousand years ago, are great love, care, and at the same time apprehension. May God grant that here in Sretensky Monastery the love commanded by Christ, ardent faith, sincere and eager care for one another would reign amidst the brothers, students, workers, and parishioners. That there would never be those things that troubled Apostle Paul as he left his disciples in Asia. That peace and joy in Christ would reign. And for this we need only one thing: that the Lord Jesus Christ, faithfulness to Him, and the fulfillment of His commandments would be the main goal in the life of the brothers and the parishioners. Then everything alien, all envious, evil and temptation that stands on the path of human life will fade away, have no essential meaning, turn into nothing—into mist and fog next to our Lord Jesus Christ. Take my yoke upon you, and learn of me; for I am meek and lowly in heart: and ye shall find rest unto your souls. For my yoke is easy, and my burden is light (Matt. 11:29–30). “In my heart and soul I take you all to Pechory. I will pray for you according to the measure of my strength. I hope to see you all in the Pskov Caves Monastery, in ancient Pskov, and the other monasteries and churches of Pskov diocese. I expect the most important thing from you—your prayers for us who are leaving Sretensky for the Pskov diocese. “It just so happens that today is the feast of the Pskov Caves icon of the Mother of God. My spiritual father, Archimandrite John (Krestiankin), blessed me with this icon to serve in Sretensky Monastery. This icon is here next to us; we brought it her from our Sretensky church. It was one of the icons in Fr. John’s cell. Tomorrow, when I and my travelling companions arrive in Pskov, now as the ruling metropolitan of Pskov diocese, is also a very important day for me: the commemoration of the apostle John the Theologian, elder Archimandrite John’s (Krestiankin’s) heavenly patron. “Finally I ask forgiveness of all of you. If I ever suddenly—and that “suddenly” was probably often—disappointed anyone, or offended anyone, or was inattentive to anyone, I ask you from the bottom of my heart to forgive me! As difficult as it must be for Metropolitan Tikhon to part from his twenty-five-year-old child—the flourishing Sretensky Monastery in his native city of Moscow—the Lord and the Mother of God have placed him in his beloved first monastic dwelling, the Holy Dormition Pskov Caves Monastery, where monastic prayer has never ceased since its founding over 600 years ago. And we who are left behind are consoled by having been part of what we truly feel to be epic. The journalist asks rather provocative and uninformed questions about the Church’s past and present relationship with the Soviet and Russian governments, and Bishop Tikhon provides his views on the complex subject of “Sergianism”, dissidents, and the Church in Russian society today. Although the liberal journalist and the bishop generally aren’t on the same intellectual page, this interview reveals what the Church in Russia now faces—no longer from the communist but now from the liberal press. Everyday Saints receives Russian “Book of the Year Award”. Everyday Saints receives Russian “Book of the Year Award”. 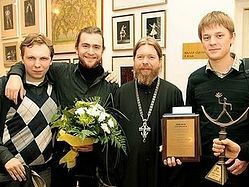 On September 5, 2012 the annual “Book of the Year Award” was given to Archimandrite Tikhon (Shevkunov), abbot of the Moscow Sretensky Monastery and author of the number one Russian bestseller, “Nesvyatie syatie i drugie paskazy”. Anthony: We appreciate your comments but we will not be having comments on the news. They have proven to be too unedifying. However we welcome thoughtful comments in a Christian spirit on our other articles. Axios! Vladyka, May God Grant You Many Blessed Years! Thank you so much for your wonderful book! Hello! Hi!. I have no comment about this article. However!!! Why are you no longer accepting comments on the news articles??? I have much to write.